I absolutely love water. It may be because I’m a Pisces, or that I grew up along the Gulf Coast of western Florida, but I can’t get enough of it. I had always dreamed of the idea of an underwater wedding someplace exotic, but that being unfeasible in the murky waters of Lake Michigan, I settled for the next best thing – an ocean themed wedding. 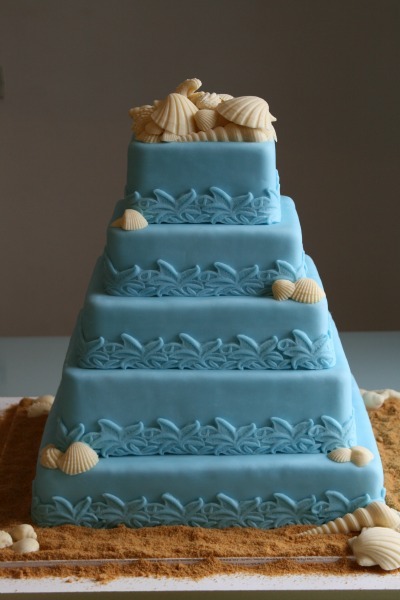 A lot of people asked me when I first started the preparations: “So you’re having a beached themed wedding right?” I politely told them no, I was having an ocean themed wedding. The difference? Beaches bring to mind sandals and palm trees, sunburns and coconut tanning oil. Ocean, on the other hand, is salt-spray, beautiful shades of turquoise, and tropical fish. It’s a thin line, but the line is there. I started my wedding planning with the dress, just because I already had an idea about what I wanted. I had heard about this extraordinary trend called “shelling,” where a designer covers the bust and hem line of the wedding dress with seashells. The effect is magical, like the bride just stepped out of the ocean completely dry. Lucky for me, I found someone local to Chicago who said she would be willing to take on the project. In addition to the shells, we decided to add a long turquoise sash to tie around the waist – just to add a fun splash of color. I also found bridesmaid’s dresses which matched perfectly. Also, as a side note, Martha Stewart has an amazing how-to guide for making a seashell bouquet that I wish I had seen before my wedding day. It’s ok though, that bouquet is reason enough to get my vows renewed someday. Next on my wedding planning was list was invitations, which I decided to DIY. I’ve always been a bit crafty, and this seemed like a fun project to do with my sister over the course of a weekend. We used beige and turquoise card stock, a mahogany Calligraphy pen, dark brown ribbon, and hundreds of tiny starfish as a finishing touch. The project did take the entire weekend to complete (I had a rather large guest list) but in the end, they turned out beautifully. I took my sister out for sushi to celebrate our achievement. After researching photographers, caterers, florists, venues, entertainment, wedding registries, and exotic honeymoon destinations, I begin looking into decorations for the venue. This is the dessert, no, the icing on the dessert – the absolute best part about wedding planning. Why? Because you’re options are unlimited. If you’re a bride getting married now, you can have anything and everything you want. The only problem you will have is staying in your budget! As it turned out, Chicago is a great place to look for anything ocean themed. I found tons of little boutique stores that sold seashell accents, unique glass bottles, nautical knick knacks, and even large quantities of sand (I was using the sand as part of the centerpiece for each table). In a cute little store near Navy Pier I found charming silver tropical fish pendants as gifts for my bridesmaids. So, I didn’t get my underwater wedding, and I wasn’t married on a beach, barefoot with sand between my toes, but I did have a beautiful wedding with the people I love – and then there were the crab cakes, which were definitely one of the highlights.